I’ve been baking scones a lot lately. I don’t know why, scones have never been something that I was a fan of. I always thought they were kinda dry and boring. When I worked at a bookstore cafe, though a lot of the bake case items were delicious (man I miss those Reese’s cookies so much even though they were probably 2,000 calories each! 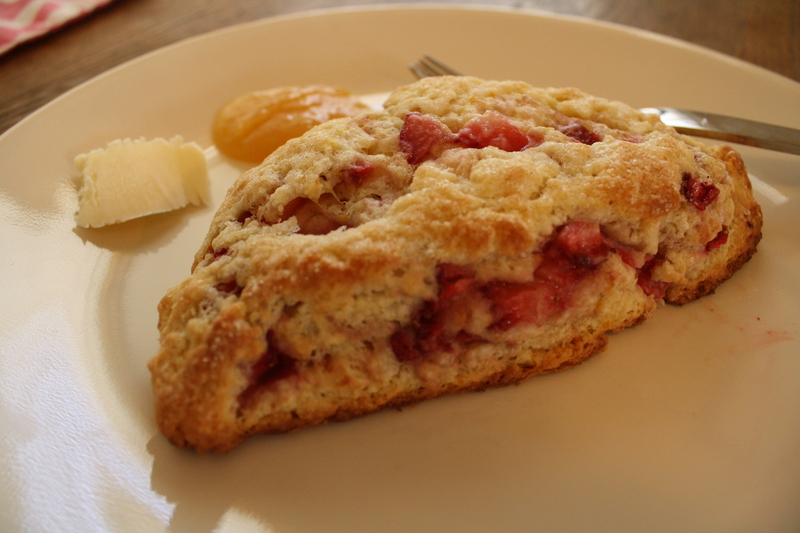 ), the scones just always seemed eh. My mom has made homemade scones though a few times, simple, plain, cream scones, with some citrus zest and plenty of toppings — fresh strawberries, fresh whipped cream, lemon curd, the works. Mmmm. I’ve made a few variations: double ginger (ground and crystallized), double cinnamon (ground and chips), plus a savory version – with blue cheese and golden raisins (not as good, but I think I messed up along the way with the mixing). Mix the dry ingredients with the zest and grated butter. Add the wet ingredients. Dough will be pretty sticky! 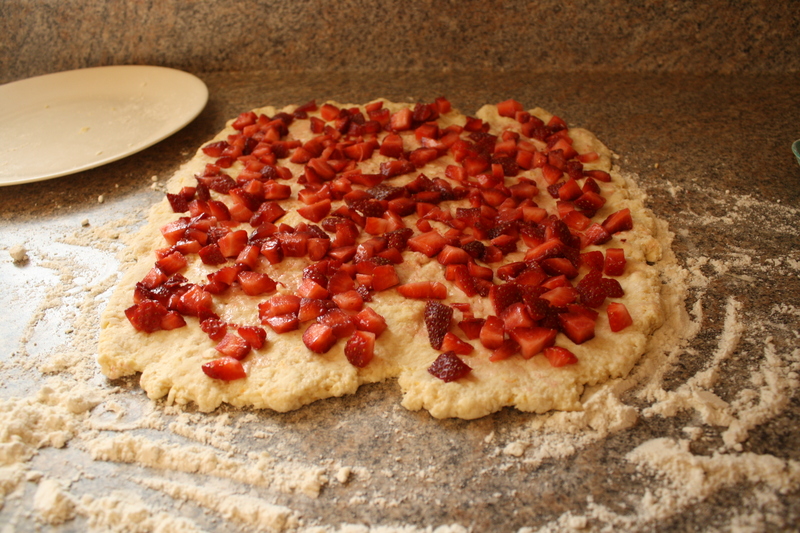 The Cook's Illustrated recipes calls for you to fold the dough up with the berries inside. 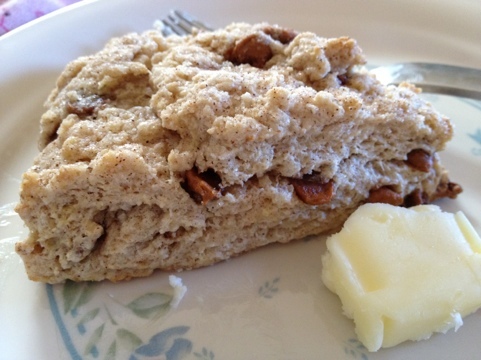 Cook Without A Book says to just flatten the ball of dough into a circle and cut into wedges. Sugar on top is a must. Sugar in the raw or any course sugar would be great too! Now, I’m a scone convert. And I’m going to keep on looking for more variations. 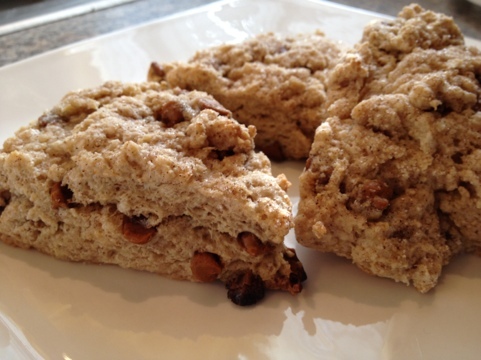 I saw an Irish cream version with whiskey butter recipe today… I may have to make that one soon! You really should get this book. Even if you don’t typically cook vegetarian meals. Everything in it that I’ve made so far is fantastic. And there are variations for everything, so you can use whatever you may have around. Adjust an oven rack to the lower-middle position and preheat the oven to 400F. Line a baking sheet with parchment paper or nonstick liner. Mix the flour, 6 tablespoons of the sugar, the baking powder, salt, baking soda, and Zests/Spices/Herbs in a medium bowl. 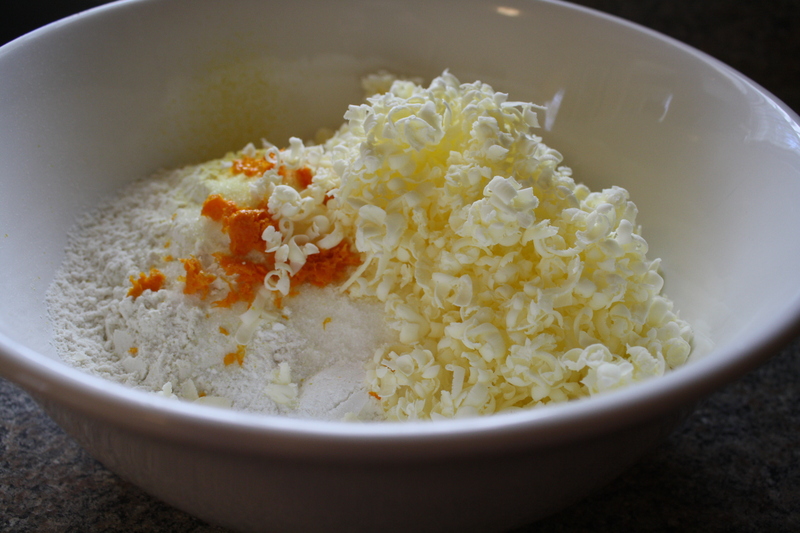 Grate one-third of the butter into the flour mixture on the large holes of a box grater; toss to coat with the flour. Repeat grating and tossing twice more. 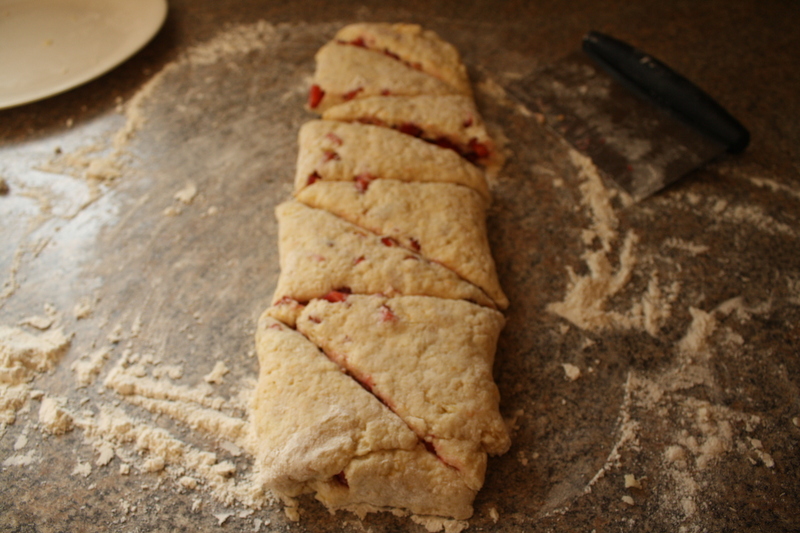 Using your fingertips, work the butter and flour together a bit more. Mix in the Flavoring. Mix the sour cream and egg with a fork until smooth. 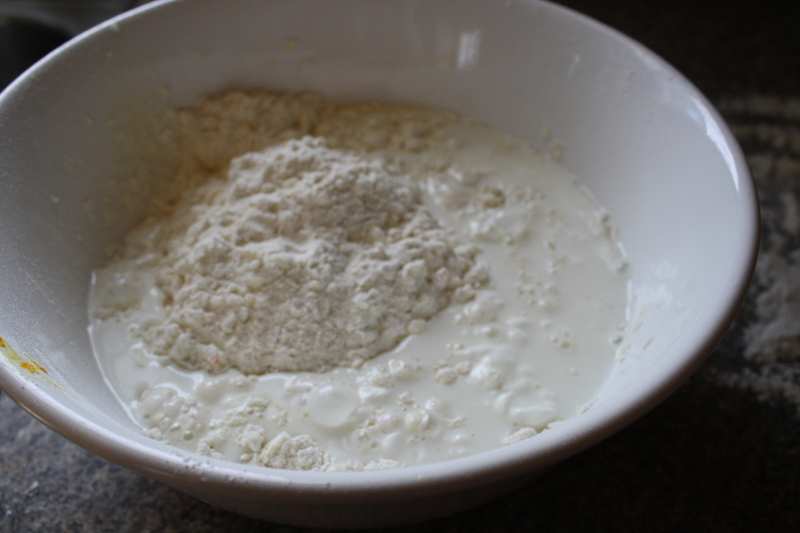 Stir the sour cream mixture into the dry ingredients with the fork until large dough clumps form. Use your hands to press the dough against the side of the bowl to form a ball. (There may not seem to be enough liquid at first, but as you press, the dough will come together. If necessary, flick a little water into the bottom of the bowl to get the last bits to adhere. Turn out onto a lightly floured work surface, and pat into a 7 1/2-inch round about 1/4 inch thick. Sprinkle with the remaining teaspoon of sugar. Use a sharp knife to cut into 8 wedges. Place the wedges about 1 inch apart on the baking sheet. Bake until golden 15 to 17 minutes. Transfer to a rack to cool for 5 minutes. Serve hot, warm, or at room temperature. Now I’m brainstorming other combinations: the authors suggests a few, like cherries and lime zest or orange zest and rosemary, but what about instant espresso powder and chocolate chips or cinnamon? You can be creative with these! 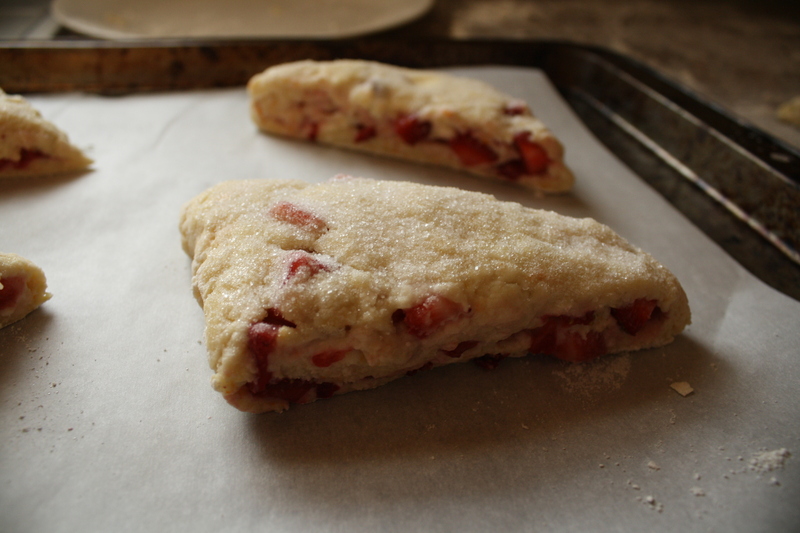 Will you make the strawberry scones for me next time you come home? They look yummo!